PHOENIX, AZ--(Marketwired - Apr 22, 2014) - SinglePoint, Inc. (OTC: SING), a state-of-the-art mobile technology and full-service mobile marketing company, announces today that it has officially launched marketing and distribution initiatives for LEGAL 420, a versatile smartphone app for the medical marijuana industry that connects patients with doctors, dispensaries and information on state-by-state legislation and procurement of ID cards for the legal use of medical marijuana. SinglePoint will receive a percentage of ad revenues on the free app and plans to market the app aggressively through social media and highly targeted public relations campaigns. LEGAL 420 was contracted for market by social media marketing maven, PITOOEY! (OTCQB: PTOO), and is a fully developed and functioning smartphone application. The app was introduced to market by SinglePoint last week at The Big Industry Show, the Cannabis Industry's "biggest B2B sales event of 2014." SinglePoint™ CEO Greg Lambrecht and his team were in Denver through Saturday where they also visited dispensaries in person to "introduce a number of products and services directly to owners as we continue to foster warm relationships with the powers that be in this multi-billion dollar emerging industry." 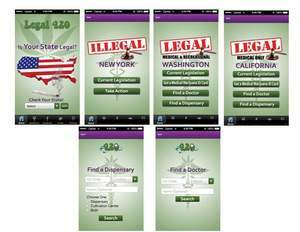 LEGAL 420 will be available on Android as of April 28, 2014 and will be submitted to iOS apple this week for approval. PITOOEY! is confident the app will be approved within 30 days, after which point it will be available on iOS. Shareholders are encouraged to download the app and spread the word. "We are very excited about the potential this app holds for SinglePoint, our customer base and our strategic partnerships, especially as part of a suite that now includes diversified solutions including LEGAL 420, Cannabis Card™ and our Pay-By-Text platform for dispensaries and their customers," states Lambrecht. As well, the company is currently in discussions to partner on a merchant services company with 'boots on the ground,' including active accounts at dispensaries nationwide. Headquartered in Phoenix, AZ, SinglePoint, Inc. is a state-of-the-art mobile technology company and full-service mobile marketing agency. We operate a best-in-class mobile commerce and communication platform specifically designed to serve the needs of the non-profit community as well as for profit companies. We make any campaign instantly interactive via the mobile phone. This functionality allows our clients to conduct business transactions, accept donations and engage in targeted communication campaigns with their customers/donors through any mobile devices. Send more messages, create more awareness, and raise revenues and donations. PITOOEY! INC. is a publicly traded company (OTCBB: PTOO) formed in late 2012. PITOOEY! is focused on the social media marketing space and currently has two key assets that have launched in 2014, in addition to attractive acquisitions in the space of social media marketing. The Company is now positioned to raise capital to execute a sales and marketing plan intended to turn the brand, and its flagship PITOOEY! application into a household name for both consumers and businesses alike.